Burgundy and Champagne are engaged in a genteel public relations battle right now to be France's next candidate to be a Unesco World Heritage Site. The impetus actually comes from Bordeaux, where the government fought to run a highway through several famous vineyards, including some of Chateau Margaux's. That plan is shelved for now, but it sent a chill through vineyard owners across France. The petitions for both regions are ambitious: the idea is to declare all the vineyards a World Heritage Site. While Champagne is not small, Burgundy represents nearly 5% of France's land. France, like all countries, is only allowed to nominate one place per year. 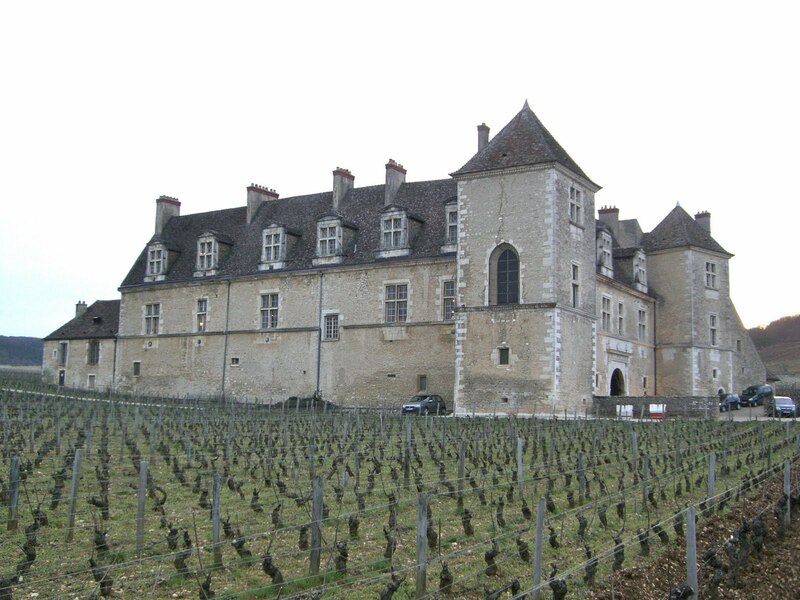 France already has 33 World Heritage Sites, and it's about time for a wine-related one. The question is, which one? It's only a decision between the world's best sparkling wine region and a region on the short list for the world's best still wines. Corrected: Currently Unesco has three vineyard areas listed as World Heritage Sites. Two are not known for their wine. One is in Pico Island, Portugal; the other is in Lavaux, Switzerland. St. Emilion in Bordeaux is also a World Heritage Site, but the historic "churches, monasteries and hospices" in the town were used as a qualification; this might not be the case for Burgundy or Champagne. Several other regions have applications pending before Unesco, and they're a step up wine-wise: the Cape Region of South Africa, the Italian regions of Langhe, Roero, Monferrato and Valtellino, and Valle Calchaqui in Argentina. It's interesting that only the Cape Region could be said to produce that country's best wines. Unesco generally goes for buildings and landscapes and history, not wine quality. Adding Burgundy or Champagne, which are pastoral but nowhere near as pretty as, say, Central Otago, might change the way Unesco thinks about its World Heritage Sites, and as a wine lover, I approve of that idea. The leaders of the movements in the respective regions talk about increasing tourism, but I think that's silly. Most people don't need the UN to tell them Burgundy and Champagne are famous, and Burgundy in particular probably can't handle much more tourist traffic than it gets now. In fact, doubling the number of tourists would create strains on the infrastructure that would defeat the purpose of being named a World Heritage Site in the first place. I wonder about unforeseen consequences like these. Would wineries have difficulty upgrading their facilities? This would be a hassle in both regions, especially for small vineyard owners who are, for example, making their own grower Champagne for the first time. I'm glad I'm not the French bureaucrat making the decision between the two regions. It's tempting to penalize Champagne for its greed in expanding its area, but no wine region in the world has more interesting history. And Burgundy is just so big -- but it's probably the mecca for wine lovers, even more so than Champagne. The decision is due at the end of the year. Uncharacteristically, I'm going to take a pass on making a choice for now, but I'd like to read what you think. I'm in Beaune, France, in the heart of Burgundy for the Grands Jours week of tasting. Every one of Burgundy's 4,327,119 vintners (I'm making up that number, but it feels that way) has set up an empty barrel in a basement somewhere with six 2008 wine samples on it. Wine buyers and journalists from around the world come to sip, make particularly ostentatious aeration noises (one guy with a handlebar mustache sounded like he was blowing his nose with a hair dryer) and try to push their way to a communal spittoon before it's too late. This is my first time here, and it's overwhelming. Today alone there were four main events in one giant convention center: the Macon, the northern part of the Cote de Beaune, the area immediately around Beaune, and the sparkling Cremants. There were hundreds of vintners, thousands of wines, and two free facial massage therapists (yes, I got one). And yet, the three American journalists here, including myself, blew off this tasting until late in the afternoon to attend one of the many smaller private tastings. I went to something called DIVA, a collection of high end wineries, where I tasted amazing wines and figured I'd get a story idea later. Hopefully that's going to happen. The lunch at DIVA -- beef bourgogne and mashed potatoes with black truffles -- was so delicious that I watched a Japanese broker eat four whole plates of it, while my guide Jean asked me about sumo. The Japanese guy, who was plump but not enormous, may have gone for five plates, but I couldn't watch any more. Tonight we're going to another massive tasting with meals prepared by 10 leading French chefs. Tomorrow there's another huge tasting, this time in Marsannay, but it competes with another day of DIVA, a tasting of wines made by women, and a tasting of organic wineries. I was also invited to private tastings by a couple of big exporters, and there's another big wine dinner at night. No matter how much you like wine, and how many you can taste, there's no way to keep up here. I feel like I was thrown into an Olympic-sized pool of top-notch Chardonnay, and I'm constantly wavering between drinking and drowning. Or getting out to throw myself into the neighboring Pinot Noir pool. * It's still too early to tell if 2009 was as great a year in Burgundy as it has been touted in the rest of France. The weather here was sunny and easy on grape growers, but there's a fear that the wines will be too big and atypical. Unlike Bordeaux, which will have its en premier tastings next week (talk about wine overload), very few Burgundy vintners are pouring 2009 samples yet. * Longtime visitors to this event have commented on how many Chinese buyers are here this year. Meanwhile, American buyers I've talked to mention that they're cutting back on selling more expensive wines. These two events are connected. * You would think that wine buyers in Burgundy would leave their perfume at home, but you would be wrong. * The large number of young vintners at top domaines is striking at first but makes sense when I think about it for a moment. 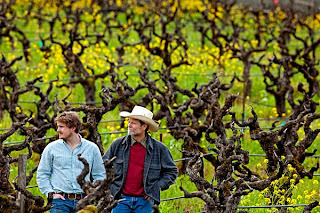 So many vineyards are inherited here that it makes sense for the age distribution of the people in charge to be flatter than in the US, where winery owners are usually older, successful business people and winemakers at well-known wineries tend to have held two or three jobs before. * There are more women winemakers than I expected, particularly as I have already heard from three different people that some believe, and don't kill the messenger here, that a woman walking into a winery will spoil the wine. I think they were joking, but what's most surprising is that this "joke" was also told to the two female journalists with me. I'd love to see this statement tried out at a public tasting in San Francisco, but I also love watching strong language and violence. * French people don't seem to need water when they taste. I'm not sure why. They also rarely use crackers or bread or cheese to cleanse the palate -- though in Chablis every winery provided parsley-infused ham and cheese. * Also, chairs are apparently for the weak. There's a fine lunch buffet provided at most of these tastings -- I have a new appreciation for aspic after tasting a shrimp/egg/orange aspic in Chablis on Monday. But so far most of them have been standing, jostling lunches. Perhaps that's meant to keep us from lingering with the food and get back in there to taste 200 more wines. * Jean told me he listened to a lengthy debate on French radio about Tim Burton's "Alice in Wonderland," about whether it was authentic and its level of artistry, etc. I haven't seen it, so my immediate response was to tell him what I know about it from US media: it was number one at the box office its opening weekend. Talk about different cultures. * Speaking of which, Jean read back through my blog for months because he wanted to know who he'd be saddled with. He told me that I get angry fairly often. Dammit, Jean, what the hell are you talking about? As long as we get this cheese course every day, I'll be happy. Konishiki was the biggest man in sumo in the 1990s -- literally. The native Hawaiian weighed in at 630 pounds and used his bulk to reach the second-highest rank in the sport, ozeki. But he retired in 1997 a little disappointed that he never made it to the top ranking. Unlike most Japanese sumo wrestlers, he has had a great post-retirement media career. He hosted a TV show for kids, did a popular series of beer ads, and still hosts a radio show of Hawaiian music. He also plays the ukelele. 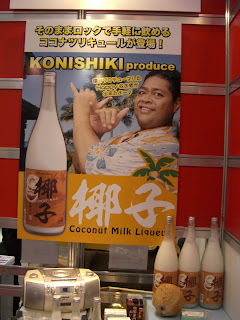 Now he's branched out into booze, with a coconut milk liqueur I spotted at Foodex Tokyo, a food trade show. 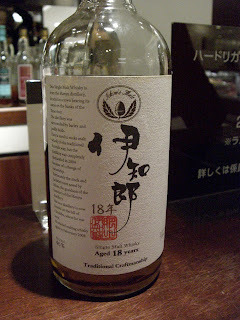 Just 7% alcohol, it's made from a shochu base with coconut milk juice and coconut fruit. I like it; it's quite coconutty, yet refreshing on the rocks. I imagine that US bartenders would love to get ahold of this for pina coladas. The liqueur has only been on the market for about four months. 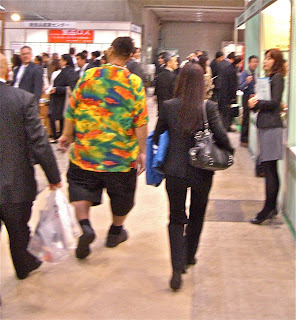 I tried to ask Konishiki about it and had the depressing experience of watching a guy I really rooted for when I first moved to Japan in 1991 -- during the peak of his career -- give me a "get-away-from-me" stare and waddle away. On the plus side, he has lost a lot of weight since having gastric bypass surgery in 2008. I'd say he now weighs around 250 pounds. He still doesn't exactly look healthy -- his weight is not evenly distributed, and he limps. But at least his life expectancy must be longer. So hey, big guy, I'm still rooting for you. Good luck in shoving other coconut-milk products right out of the ring. Am I the only one who doesn't know what corporate wine names mean anymore? Example: Which of these is more expensive: Sonoma Reserve Merlot, or Winemaker's Select Merlot? How about this: Private Selection Merlot, or Central Coast Merlot? The folks at Constellation Brands sent me a box of 6 of their California Merlots recently, and looking at the labels made me realize how bewildering the wine-buying process must be for the beginning drinker, not least because several claim to be "handcrafted." What the hell does that mean? The winemaker crushed the grapes with his hands? All 6 of these wines retail between $11 and $20. You'd think, made by the same company in a fairly narrow price range, there would be taste similarities. But in fact, they were dramatically different, and not in any predictable way. Take the two Blackstones. Being a wine writer, I guessed that the Sonoma Reserve is pricier, and better, because the Winemaker's Select has a California appellation. But would the average drinker know that? Are we used to Vintners Select not meaning anything of the sort? Moreover, the heavy bottle and overall look of the Blackstone Sonoma Reserve had me expecting an oaky, full-bodied wine, but in fact it was leaner than I find appealing in a Merlot. 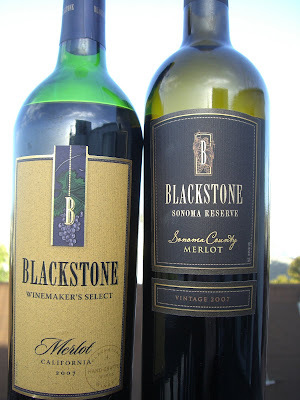 The Blackstone Winemaker's Select made me bow down to Constellation's marketing expertise. Nobody has published more incisive research on how different types of consumers respond to wine marketing. I'm going to guess that Constellation knows people who don't realize "Winemaker's Select" is meaningless are beginners, and in fact that Merlot is so much like Juicy Juice that I felt the need for a sippy cup. I'm not its target market. Maybe it's just "Select" that's meaningless -- after all, that is what Safeway calls its private label brands, and personally I don't look to Safeway canned goods for exquisiten ess. However, you have to wonder when Constellation will give up on Robert Mondavi Winery as a superpremium brand and just shelve it with Inglenook (once the best winery in California). If I were 22 years old and I tried this wine, I would not later want to spend $150 for a Robert Mondavi Winery Private Reserve Cabernet or Napa Valley Reserve Cabernet or Winemaker's Handcrafted Reserve Special Single Vineyard We Really Mean It This Time Cabernet. I'd just order the Spottswoode. About the Clos du Bois North Coast Merlot (not shown) -- where the hell is the North Coast, anyway? Eureka? Vancouver? There's another wine label term I just don't understand. Officially, it's a six-county area of 3 million acres. Do consumers find it more appealing than "California?" And is it better? 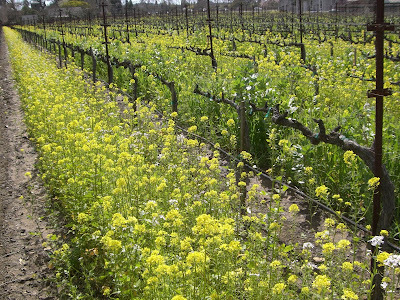 Kendall-Jackson gives some of its nicest Chardonnay blends the California appellation because there's no easier way to combine Santa Barbara County and Sonoma County. A "North Coast" wine could legally have 85% Solano County fruit with 15% from anywhere else in the state. Oh, yeah, the wine -- meh. Inoffensive. Then there's Estancia, which offered for $12 what appears to be a single-vineyard wine ("Keyes Canyon Ranches"), although it is a 600-acre vineyard and the appellation is Central Coast, one of the largest and most generic in the state. However, the technical sheet I got with the wine -- something consumers wouldn't see -- raised more questions than it answered. "Estancia Merlot is sourced from Monterey County and Paso Robles," it read. According to US law, wineries can't list a vineyard on the front label unless at least 95% of the grapes are from that vineyard. How could this wine be a Keyes Canyon Ranches wine and not qualify as Paso Robles appellation? Is Constellation convinced that "Central Coast" is a better selling point than "Paso Robles"? If only the wine weren't filled out with 4% Syrah ... that said, all these wines except the Simi have some Syrah in them. Nothing against Syrah, but I prefer Bordeaux grapes blended with other Bordeaux grapes. But still, this is the bargain of this group: I like it almost as well as the Simi and better than all the others, and it's probably available discounted under $10. It tastes like juicy red currant, a little on the tart side, but better with food because of it. Moral of the story: When confused by label language, go for the single-vineyard wine -- whether or not it's handcrafted. Eisch, a premium wine glass maker, lost a lawsuit in German court because German judges don't have good palates. I know -- I taste-tested the product in question, and despite what the German court says, it is different. Eisch, a small family-owned German company, makes a glass it calls "breathable," which it claims aerates wine in two to four minutes. 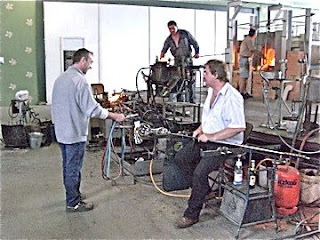 Riedel, the Austrian glass giant that recently swallowed Spiegelau, sued, saying that Eisch's claims were false advertising. Eisch lost the case in January, but the news just surfaced this week. I suppose Eisch had no interest in publicizing its loss and Riedel didn't want to trumpet its win, because to do so would have meant giving publicity to its much smaller rival. According to Tim Teichgraeber, the court found that the flavors of wine in the Eisch breathable glass did not differ from an ordinary glass, "neither in a food chemistry analysis nor in a gustation (tasting) test carried out by experienced wine tasters." I'd like to know which tasters the court called on. 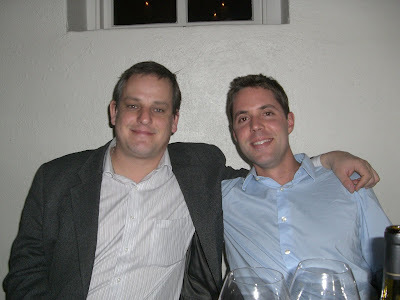 Michael Franz, my editor at Wine Review Online, and I did blind taste tests of Eisch's breathable glass last year, and we both found that wine, sake, Cognac and coffee all tasted considerably different than when served in comparably shaped non-breathable glass. In any case, Michael and I walked away from the test in disagreement about what tasted best, but in complete agreement that the Eisch breathable glass made a difference. So I'd like to know which tasters the German court called on. In fairness, Eisch hurt its case by refusing to release any details of what exactly makes its glass "breathable." Company president Eberhard Eisch claimed he was in a tough spot: if he released his technology to appease the court, Riedel could easily copy it. Eisch said that was the reason he hadn't applied for a patent. It's plausible, but not an argument a court is likely to sympathize with. Eisch won't have to pay damages, but will have to pay Riedel's court costs -- which could be substantial -- and stop advertising the "breathable glass." Perhaps at this point Eisch will come forward with a technical explanation. Or maybe they'll drop the whole thing. In the meantime, if you find an Eisch glass with a little Nike-like swoosh beneath the company's name, that used to mean "breathable." Now it just means swoosh. However, wine drinkers are learning so fast that the study -- which includes wine vintages from 1998 to 2005 -- might already be outdated. I certainly hope so. It's hard to fault their method. Economist Magali Delmas of UCLA and Laura Grant of UC Santa Barbara studied ratings and prices in Wine Spectator, which is probably as consistent as any rating publication. They determined that wines made from organically grown grapes scored an average of 1 point higher than wines made from conventional grapes. The pricing of these wines was most interesting. For wines over $25, wines that used organic grapes but did not mention this on the label -- Shafer Vineyards comes to mind -- average prices were 13% higher than conventional wines of the same appellation, variety and year. But for wines that did mention organically grown grapes on the label, prices were actually 7% lower than conventional wines. The study authors told Tom Jacobs that they thought the stigma of bad organic wine held down prices. And indeed, there is a huge difference between "organic wine" and wine made from organically grown grapes. Under US, but not European, law, "organic wine" must not contain sulfites, and thus quickly loses its fresh fruit flavors. I prefer wine made from organically grown grapes, but avoid organic wine because I don't like (literally) rotten wine. However, I'm not sure that an organic stigma for wine is the story here. Until recently, wineries that put their organic farming habits on the label tended to be do-gooders. The same kind-to-the-Earth instinct may have held them back from charging their customers whatever the market would bear. Meanwhile, a fairly sizable number of wineries that farm organically but don't want people to know about it are selling Napa Cabernets to anti-environment Republicans. That's really the only reason in 2010 that a winery wouldn't want to put "made from organically grown grapes" on the label, but it's still a powerful one. If you look at the wine list from any Dallas steakhouse, you'll see some Napa wineries taking nice profits that they don't need to endanger with any of that liberal green nonsense. If you compare a good winery's Napa Cab price to average Napa Cab prices, it's going to be higher because the overall Napa Cab average is brought down by bulk-wine bottlings like Cameron Hughes, Avalon and Educated Guess (nothing wrong with these, btw; some of their Napa Valley Cabs are the best values from the region). So let's not worry about point 2 above, the pricing of wine made from organically grown grapes. I think the study authors are wrong and that there's a much stronger market for these than just five years ago, but we won't know one way or the other until 2015. Wine prices are just too much in flux, and this study is already too old, to make any kind of definitive statement. Focus on point 1: Wine made from organically grown grapes is better. Even James Laube thinks so, so it must be true. I'm sorry that there are only two possible senses that I can communicate with on this blog. You can read and look at photos, and if you really want to, you could run it through a speech program and listen. But you can't smell or taste the wines I'm about to describe, nor experience their mouthfeel, and that's a damn shame. 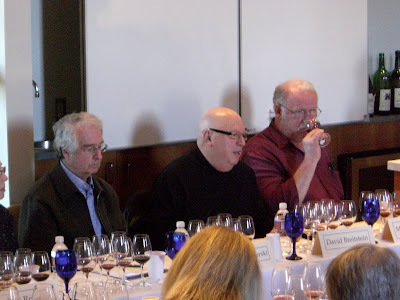 On Saturday morning I had the honor of co-hosting one of the best tastings I've ever been to, as a precursor to this year's induction into the Vintners Hall of Fame. David Breitstein, owner of the Duke of Bourbon store in Canoga Park, brought some historic California magnums from his collection, and was matched by a couple from some Hall of Fame winemakers. That's David in the photo, flanked by Warren Winiarski and Mike Martini. This tasting will never be duplicated. 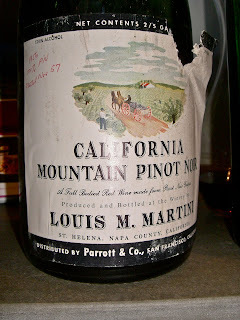 The oldest wine -- and my favorite -- was a 1956 Louis M. Martini Pinot Noir made as an experiment by VHF member Louis P. Martini; his first commercial release was 1957. Mike Martini, Louis' son and now the master winemaker, said he last drank the wine on the day his father died because he had the blues, and after the one we drank Saturday there's only one more left. Mike took the bottle home afterward because his father persona lly wrote the bottling date on the upper left corner of the front label (check out the photo). Anyone who thinks California Pinot doesn't age should have been at this tasting (note for next year -- it was only $150 for 7 irreplaceable wines and included a winery lunch afterwards.) Mike said his last bottle of it had only a 30-minute window of drinkability, but this wine was lovely: perfumey, savory after 45 minutes, with plenty of dried and fresh cherry fruit and tremendous complexity. Mike said that this was the wine for which his father developed the Martini Clone of Pinot Noir that now accounts for about 1/3 of all Pinot grown in California. Let's hope they all age that gracefully. We also enjoyed a 1970 Louis M. Martini Special Selection Cabernet Sauvignon that Mike said was one of the first wines in Napa for which a winery did a barrel-selection reserve wine. In his day, Louis P. Martini was known for soft tannins and gentle mouthfeel, and critics claimed his wines wouldn't age. Martini responded by holding some wines in the cellar and selling them for 50 cents extra for each year of bottle age. The 1970 Special Select Cab -- the top of the line wine, one of the best in Napa Valley -- was less than $3 on release. That would have been a great investment, as the wine was supple and beautiful today. Al Brounstein was inducted into the Vintners Hall of Fame this year, and unfortunately he's no longer with us, but his wife Boots Brounstein and son Phil Ross searched their collection for a special bottle for us. 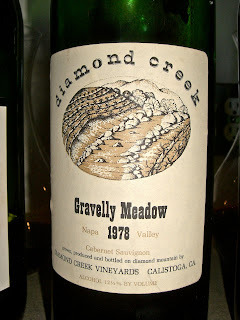 They settled on the 1978 Diamond Creek Vineyards Gravelly Meadow Diamond Mountain Cabernet Sauvignon. After more than 30 years it still has its structure, like a war veteran with his pride, yet has softened over the years and become easily approachable for anyone. Boots said they have very few bottles of it left, so we were glad to taste it. Brounstein was famous for making three different wines (and occasionally four) from sites on his relatively small vineyard with different soils. Ross said it took him 15 years to turn a profit, in large part because nobody understood the idea of terroir that Brounstein was trying to prove. Winiarski, a VHF member, told us that unlike Brounstein, he preferred to blend grapes from the different soils on his site. Winiarski said that Cab grapes grown on volcanic soils brought a fire character, while Cab from clay soils brought water. Fire, water, fire, water, he repeated: for a scientific guy, Warren sounded quite metaphysical. 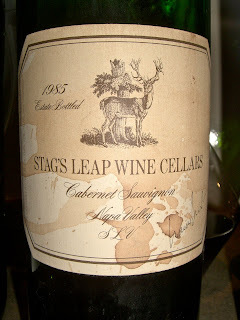 Whatever his philosophy, his 1985 Stag's Leap Wine Cellars SLV Vineyard Cabernet Sauvignon was awesome, and the first of my glasses to empty (how did that happen?) It still has punch and backbone, as well as vibrancy, yet the mature flavors give it depth. It wouldn't be cheap, but this is the perhaps the most possible of these wines to acquire today, so if you see it, go for it. Warren believed after tasting it that it will last another decade or more in the cellar. I hope to test that theory sometime. Incidentally, the bottle is stained because it survived the Northridge earthquake in Breitstein's cellar, while the bottle beside it did not. The 1969 Mayacamas Vineyards Cabernet Sauvignon was stellar, but we didn't have a live person there to talk about it, so Warren and David shared stories about Bob Travers. But my favorite story of the day came from Boots Brounstein. When she and Al moved to Napa Valley they didn't know anyone, so they sent invitations to all the existing wineries to come to their house one weekend for a party by their lake. Three hours after the party was supposed to start, nobody had arrived. All the food was sitting uneaten. Hostess disaster. Then they heard a car come over the hill. It was Winiarski and his family, the only people to greet the newcomers. The audience applauded Winiarski's social graces, but he demurred. "My kids wanted to swim in the lake," he said. Only one wine was corked, the 1985 Heitz Martha's Vineyard Cabernet, and that was a disappointment, but 6 out of 7 ain't bad. The last wine we tasted was a 1997 Joseph Phelps Insignia. Though it's only 13.8% alcohol, it was the highest of the group -- some of the others were an impossible-to-imagine-today 12 or 12.5% -- and to me, it was like following a Chopin recital with Emeril Lagasse going "Bam" in my face. Yes, it was a nice wine, but in this crowd it was a rambunctious youth. I am sorry to tease you with these descriptions, but you know, we're going to do something like this again. Don't miss it next time. I've got another giveaway contest here, so sharpen your pencils, haiku fans. The tickets are for the Donkey & Goat Winery Open House in Berkeley. 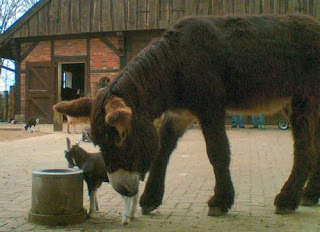 I really like the Donkey & Goat wines. They're very European-style, never overripe, fermented with wild yeasts. The Chardonnay is one of the most Chablis-like you'll find in California, and the Syrah is an earthy wine with real character. And owners Tracey & Jared Brandt are fun people, so I'm sure this will be a blast. I'd go myself, but I'll be in Burgundy (it's a tough job but somebody has to do it). So I'm giving my tickets away to whoever writes the best haiku that includes either "donkey" or "goat." This should be more of a challenge than it seems, as most urban folks who are close enough to attend the tasting aren't around a lot of donkeys and see goats only on menus. Saturday, March 20 1 p.m. -- 5 p.m. Taste 7 new wine releases, eat goodies from new Berkeley restaurant Locanda da Eva, and enjoy jazz played by the Michael LaMacchia Trio. Write the best haiku that includes either the word "donkey" or "goat." Put it in the comments below. The deadline for entries is 5 p.m. Berkeley time on Wednesday, March 17. I will announce the winner promptly afterward. It is YOUR responsibility for making sure I know who you are so I can get your name to Tracey and Jared. You might want to leave your Google profile open so I can check it. On my last contest I had to award the tickets to a runner-up because I couldn't contact the winner, so do keep that in mind. I'm declaring the Mourvedre lover the winner. I like the subtlety of the donkey reference; that's in keeping with the Japanese aesthetic. Congratulations and enjoy the tasting. I have a story in the Los Angeles Times today about old-vine Zinfandel. There wasn't space for many tasting notes, so I'm supplementing with some wines that I just didn't have space to include. By now you have probably read that 12 members of a French consortium were convicted of fraudulently selling Merlot and Syrah as Pinot Noir to Gallo, to be bottled under the Red Bicyclette label. I've been reading the finger-pointing stories, such as Dave McIntyre's piece in today's Washington Post, and maybe it's jet lag, but I can't help feeling contrarian. I know it's a crime, and I'm glad the French authorities are taking it seriously. But I don't feel sorry at all for consumers who were duped. Here's why: Why would anybody expect Pinot Noir from the Languedoc region from Gallo for $8 to be good in the first place? If you only have $8 to spend on wine, you should be looking for competence, not greatness. And you most definitely should not be looking for Pinot Noir. Taking it one step further, anybody who thinks an $8 bulk-wine Pinot Noir from the Languedoc is worth drinking would never notice that it's not Pinot Noir, which is exactly why the crime took so long to detect. Moreover, while I think Gallo does a great job with some of its cheap labels -- some of the Twin Valley line are excellent -- I have never liked Red Bicyclette. If somebody falls for that silly label with the cartoon Frenchman, rather than buying a real French-run value wine from the same region (and there are plenty), then I just don't feel all that sorry for them. It's a crime, for sure. But it's more of a crime against the rest of the industry than against the consumers who bought the bottles. The French conspirators, as well as Gallo, gave some Americans an unrealistic expectation of how cheap Pinot Noir can be. That hurt legitimate growers all over the world who were unable to move their $25 Pinots -- and even $25 is pretty cheap for drinkable Pinot. I'll cry for struggling vintners, but my eyes are dry for Red Bicylette buyers. It's just like when somebody sidles up to you and offers you a Rolex for $50: You get what you pay for. Browsing in the Isetan department store in Tokyo's Shinjuku area, I discovered a great new idea in making shopping more painless: A Scotch bar. 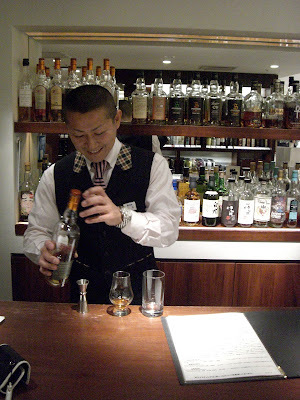 The bar sells rare and unusual Scotches -- and a few Japanese single-malts -- by the shot, starting from about $3 US. Given the quality of the whiskeys, as well as the service, I expected the prices to be much higher. A dedicated bartender who knows his wares well pours your shot and also gives you a glass of bottled water on the side. I could get used to shopping like this. 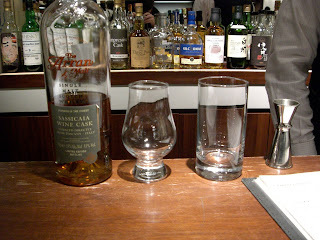 I chose an Arran single-malt matured for 8 years in a Sassicaia wine cask, and imported directly from Italy by Isetan. It was 55% alcohol, so I added a wee drop of water, but not before enjoying a sip neat. I liked the complexity, with grilled wheat toast and buttery notes, though I didn't detect any wine flavors the way you do in, say, Glenmorangie's various wine bottle-finished Scotches. The long smooth finish was the highlight. For 315 yen ($3.50), it was the price of a latte and a lot more useful in easing the stress of shopping. My friend Lucy had a Japanese whiskey, Ichiro 18-year single malt, which our bartender said recently won a contest somewhere for world's best malt. It was 46% alcohol and the attack was actually a little sharper than the Arran's, but ultimately I liked it better without the water. It had a really interesting smokey bacon character and a nice smooth finish. And the shot was just 350 yen -- less than $4 US. In Tokyo, those prices are insanely cheap. Most small bars sock you with a cover charge just to sit down that's usually more than 1000 yen. I once had a shot of Springbank 12-year at an unexceptional neighborhood bar -- one shot -- and it cost me more than $50 with various fees. 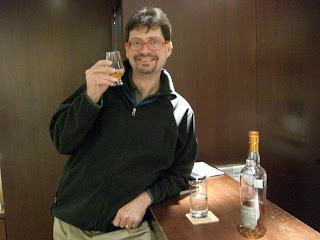 So you could have three excellent, unique Scotches at Isetan for less than the price of a seat elsewhere. Isetan also has a separate wine bar and a Spanish ham bar; the former seemed overpriced, but the latter wasn't a bad deal. And when you emerge from little alcoves of peace and pleasure, you can have some of the world's best chocolate just around the corner. But who needs to emerge? Shopping everywhere should be like this.